Genea-Musings: Amanuensis Monday - Post #291: 1766 Letter of Administration for Henry Pickel (172901765) Estate of Readingtown, N.J.
Amanuensis Monday - Post #291: 1766 Letter of Administration for Henry Pickel (172901765) Estate of Readingtown, N.J.
One Thousand Seven Hundred and sixty six 1766. New Jersey Surrogate's Court, Hunterdon County, Wills, Liber 13, page 207 (image 490), Henry Pickel Letter of Adminstration, 1766; in "New Jersey, Wills and Probate Records, 1656-1999," digital images, Ancestry.com (http://www.ancestry.com: accessed 7 September 2015, images no longer available); citing original data from New Jersey County, District and Probate Courts. From the Calendar of Wills book, it is evident that an inventory of Henry Pickel's estate was taken on 21 December 1765 by Waland Van De Vander and Samuel Wyckof, which was valued at £ 663.3.3. That paper was not in the Ancestry collection to my knowledge. If it was, I didn't get it. I believe that the Baltheser Pickel who is one of the administrators of this estate is the brother of Henry Pickel is one Balthasar Pickel (1720-1786). They were sons of Johann Balthasar Pickel (1687-1765) and Anna Gertrud Reiterin (1684-1761). John Melich may be Balthasar Pickel's (1720-1786) daughter Anna's father-in-law, since Anna Pickel (1749-1823) married Christian Melick (1744-1788). Unfortunately, the four children of Henry Pickel are not named in this document. 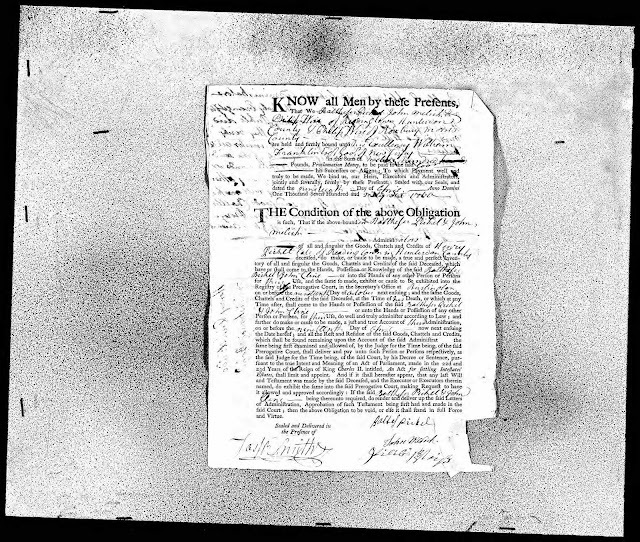 I am descended from Elizabeth Pickel (1764-1849) who married Jacob Sovereign (1759-1845) in 1781 in New Jersey, and migrated to Ontario Canada after the Revolutionary War.